An incorrect assessment as it turned out. 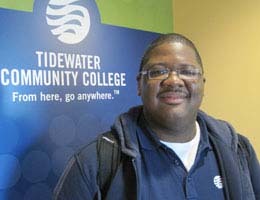 Despite a serious heart attack that resulted in severe memory loss, Givens will graduate from Tidewater Community College on Dec. 18 with an Associate of Applied Science in Information Systems Technology. He will attend Old Dominion University in January to work toward his bachelor’s in computer science. From there, he plans to complete his master’s in computer forensics at James Madison University. “It wouldn’t have happened without my start at TCC,” Givens said. One day Givens was dressing for his part-time job at Best Buy. A week later, he woke up in a hospital bed, fixated on nothing but the TV tuned to children’s programming in front of him. When Givens got the news that he had suffered a heart attack, he was stunned. “I was a high school junior,” he said. The heart palpitations Givens had noticed previously never alarmed him, but later he learned those were among the early signs of Wolff-Parkinson-White, an electrical abnormality in the heart that leads to episodes of rapid heart rate. “I was actually brain dead for a while,” said Givens, who spent 17 days in intensive care. Prior to his illness, he was an honors student at Landstown High School and participated in student activities. But a month-long hospital stay followed by more recuperation at home led him to fall behind academically. “I passed my junior year by the skin of my teeth,” he said. The extreme memory loss made retaining information difficult. The small class size and individualized attention TCC offered were selling points. Givens initially enrolled in remedial classes but advanced onto the dean’s list. Social interaction was also a challenge, until Emanuel Chestnut, today the dean of student services on the Norfolk Campus, encouraged Givens to become involved with Student African American Brotherhood (SAAB). Last spring, Givens became president of the student organization dedicated to empowering young men through higher education. Working for the office of student activities on the Virginia Beach Campus furthered his confidence, and the gym in the student center played another important role. “I wasn’t in the best shape before,” said Givens, now 60 pounds lighter than he was at the beginning of the summer thanks to regular workouts.